Stress is a big issue for our students, and I thought I’d bring together some helpful resources on the topic. You might also be interested in The Best Posts & Articles On Recent Study About Student Anxiety. Wow, This Is A “Must-Read” Article On The Brain & Learning! Interview: How Does Classroom Stress Affect Learning? is by Anthony Cody at Ed Week. Back to school: Dealing with academic stress describes experiments and helpful interventions. Stress does shrink your brain, research shows reports on a study that found “suffering from stress for long periods of time can shrink the brain.” Unfortunately, the newspaper article does not actually cite the source of the study. Newsweek recently ran long article on people lack of self-control in spending and saving. It provides a readable overview of research on self-control, though most of it won’t be new to readers of this blog or my books. It did share information on something that most of us in the classroom know already from our experience, but I hadn’t seen research on it before: reducing anxiety increases self-control. Extreme Stress Could Shrink The Brain is from The Huffington Post and reports on some recent studies. Feeling stressed changes how people weigh risk and reward…. under stress, people pay more attention to the upside of a possible outcome. This means when people under stress are making a difficult decision, they may pay more attention to the upsides of the alternatives they’re considering and less to the downsides. So someone who’s deciding whether to take a new job and is feeling stressed by the decision might weigh the increase in salary more heavily than the worse commute. The increased focus on the positive also helps explain why stress plays a role in addictions, and people under stress have a harder time controlling their urges. “The compulsion to get that reward comes stronger and they’re less able to resist it,” Mather says. So a person who’s under stress might think only about the good feelings they’ll get from a drug, while the downsides shrink into the distance. It’s a reminder– for me, at least — that when a student is having self-control issues, there may be more than meets the eye. It’s Good to Be the Top Banana is by Jonah Lehrer and appeared in The Wall Street Journal. It discusses research that has found stress is greatly increased by feelings of powerlessness. Stress assessment: Rate your stress level is from The Mayo Clinic. This Stress Test is from The Mental Health Foundation. The Stress-O-Meter is from The Centers For Disease Control and Prevention. A Stress Test For Children is from The Escambia School District, and cannot be taken online. The Stress Test is from The BBC. Helping Teenagers With Stress is a nice hand-out from the American Academy of Child and Adolescent Psychiatry. Teens and Stress is the same video I’ve previously posted on this list, but this version is not hosted on YouTube and could be more useful to teachers whose content filters block that site. Stress and Coping Center is from Kids Health. Help Students De-Stress for Success is from Edutopia. Ten Things You Should Know About Stress is by Eric Jensen. Stress-Busting Smiles is from The Wall Street Journal. Stress levels and physical complaints declined by roughly 15% after employees were directed to spend 10 minutes writing about three things that had gone well each day, says a team of researchers led by Joyce E. Bono of the University of Florida. Since 2007, the American Psychological Association (APA) has conducted a survey of different aspects of stress in America. This year’s analysis focused on teens, and on a 10-point scale, adolescents ranked their stress at 5.8, compared with a score of 5.1 reported by adults. People Are Loving This Teacher’s List Of Ways Students Can Deal With Stress is from BuzzFeed. Teaching Teenagers to Cope With Social Stress is from The New York Times. Six tactics to help your students deal with stress is from The Guardian. Seven Ways to Reduce Stress in Anxious Times and may or may not be behind a paywall. 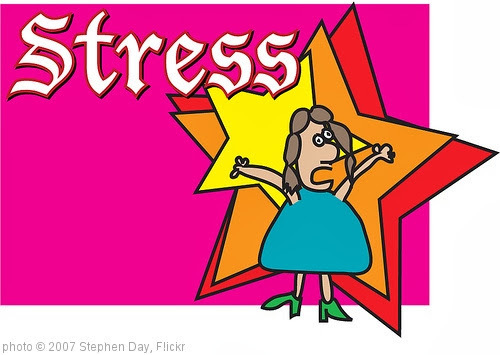 Stress May Not Only Affect the Brains of the Stressed is from Psychology Today. The Stress Sweet Spot is from The NY Times. How to Be More Resilient is from The NY Times. I agree that list making is a great way for students and adults to prioritize and relieve stress. This habit will not only benefit them academically, but will also become a useful tool for them to balance their family and career in the future.. What is an effective way to persuade students to utilize this simple task? My 12th grade students liked to use the website http://tadalist.com/ as a means to keep track of course requirements, project deadlines and work done!